When Japanese motorbikes first appeared in the west many laughed at the poor quality and dismissed them out of hand. However, only fifteen years later the likes of Yamaha and Honda were producing far better bikes and before long were outselling all the other popular US and UK bikes. And so it goes with Sunny. When we tried their first budget rowing machines we laughed... well perhaps not quite, but we certainly weren't impressed. 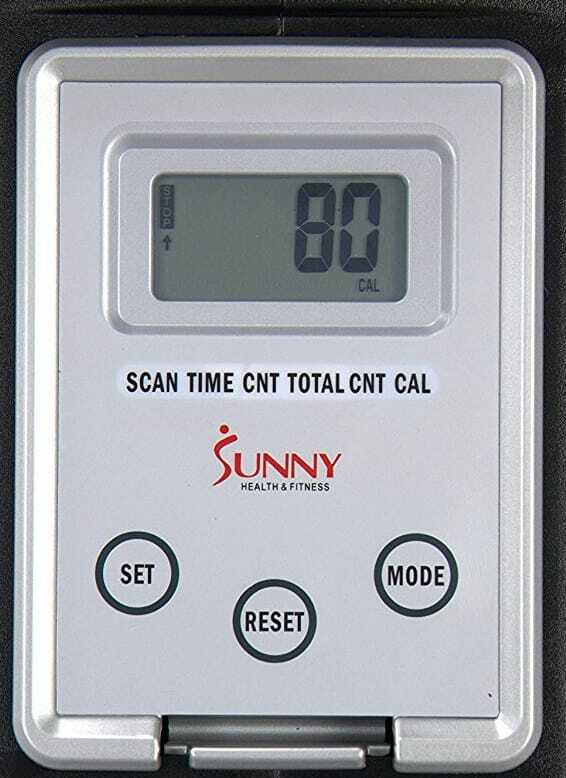 But with every passing month, Sunny seems to bring out another low-cost model and they are getting better. Yes, they're still using generic parts and piecing them together to keep the cost down, but they are listening to the consumer and making the effort to provide what the market is asking for. 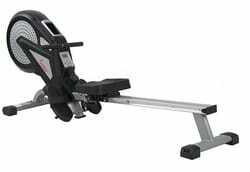 And that, is a no-nonsense, affordable rowing machine that will help you get into shape and not break down after 3 months use. So hats off to Sunny on that respect. So onto the SF-RW5623 - what's it like? 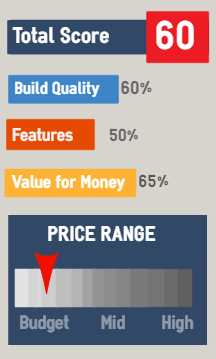 Short answer... pretty damn good for the price. Of course it has its limitations but for what you pay you get a reasonably good rowing machine. Assembly is straightforward taking around 40 minutes. The rowing position is good. 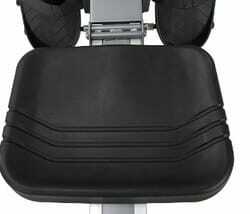 The generic seat you'll see on a dozen or more rowers is adequate. If you're larger in the seat area you might find it a little snug. The angled beam isn't so low as to make it difficult to get on and off, something you ofter find in the lower end of the market - something to bear in mind if you have back or knee problems. The handle has a good diameter for a solid grip to prevent slipping and hand blisters. Plus the all-important foot pads are wide and will keep your feet in place without slipping. However, the location of the footrests directly beneath the handle means it bumps back into the housing at the catch - the end of the stroke. This can be an issue with many budget rowing machines. If you're short in the arm this may not be an issue for you, but otherwise it could get annoying during a long workout. When you start to row it feels solid and sturdy and even when stepping up the pace it doesn't slip and slide, or have any annoying squeaks. It is a little louder than a magnetic only resistance machine because it also combines a flywheel for added air resistance. This helps to give it a more authentic feel of rowing on water, that is, the harder you pull the more resistance you feel back. ​Magentic only machines often have a 'dead-spot' where you feel a lag, but with this machine the use of air prevents that. It's not the smoothest of rides, especially when compared to Concept2, but that does cost three times as much! ​A knob beneath the display allows you to select one of eight resistance levels. The range is reasonably good to make a difference in your workout, but note, it doesn't have to be at the highest level to make it the best workout. 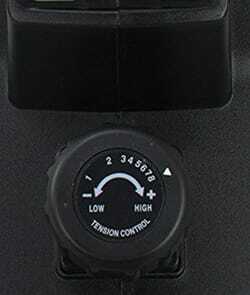 See how to use damper settings for more information. An air outlet above the display blows cool air in your face, but if you find it distracting it can be angled to blow elsewhere. This is a folding rowing machine and is easy to do and move thanks to wheels in the front legs. Folding models are useful if your space is limited and you need to store away after use. As we say for all budget rowing machines - you can't expect much in the technology department. 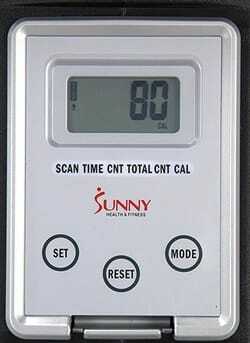 This is your standard basic display that shows time, count, calories, total count of strokes. It also has a scan mode that display each of the above every 7 seconds. This is all basic stuff but it would allow you to keep a record of your workouts so you can see where you've improved over time - important to keep you motivated. One of the issue we have with this sort of display is that they don't show distance. This makes it difficult to measure progress in the most obvious way - and that is, times over 1000, 1500 or 2000 meters. Unfortunate but it shouldn't be a dealbreaker for most. And remember, there are other ways to keep thing interesting - see my article on how to get creative with your workouts. ​Some budget models come with a built-in receiver for a heart rate monitor - but this isn't one of them. For a similar price both the Stamina Air Rower is a comparable machines. Or if you like pre-set programs including heart rate workouts, the Stamina 1130 is very good value for money. No user comments yet, let us know what you think.